The Inti Raymi is a celebration celebrated from the time of the Incas during the winter solstice to worship the Sun god, it implies colorful costumes, fancy banquets, festive music, and historical recreations; Besides, it is undoubtedly one of the best experiences prior to your visit to the Inca city of Machu Picchu. When is Inti Raymi celebrated? This festival in honor of the Sun, is celebrated every year precisely during the winter solstice in the Southern Hemisphere, JUNE 24. 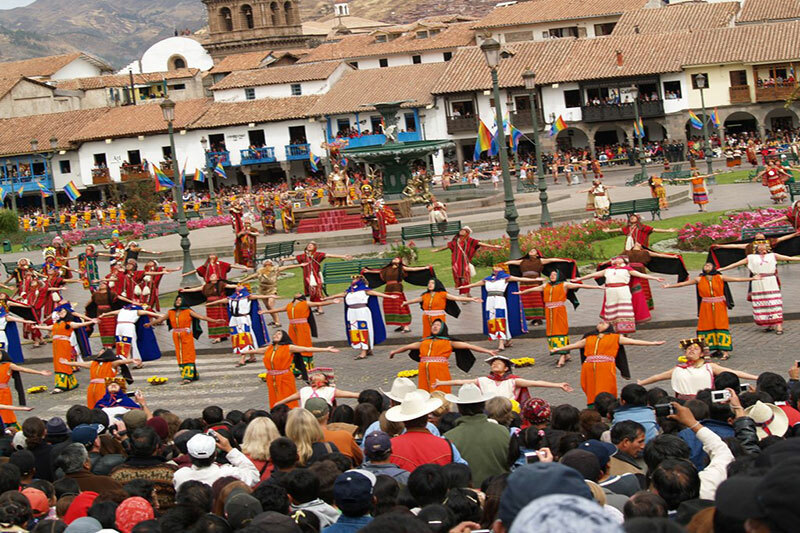 This festival is one of the most important events in Cusco (capital of the Inca empire), as it coincides with the city’s anniversary and attracts thousands of visitors from all over the world. Many chroniclers say that about 25,000 people gathered in Cusco to celebrate the Inti Raymi party. The Inca and his family, the nobles, priests and chiefs of the Inca Empire gathered in Huakaypata (present place of arms of Cusco), to witness a huge celebration in which even the ancestral mummies of temples and nearby sanctuaries were brought. It is said that at least 200 llamas were sacrificed during the holidays, and Huakaypata was blood-stained and abundant chicha (sacred drink Inca). The celebrations took place from dawn to sunset. There were special dances and burning of coca leaves in large quantities. 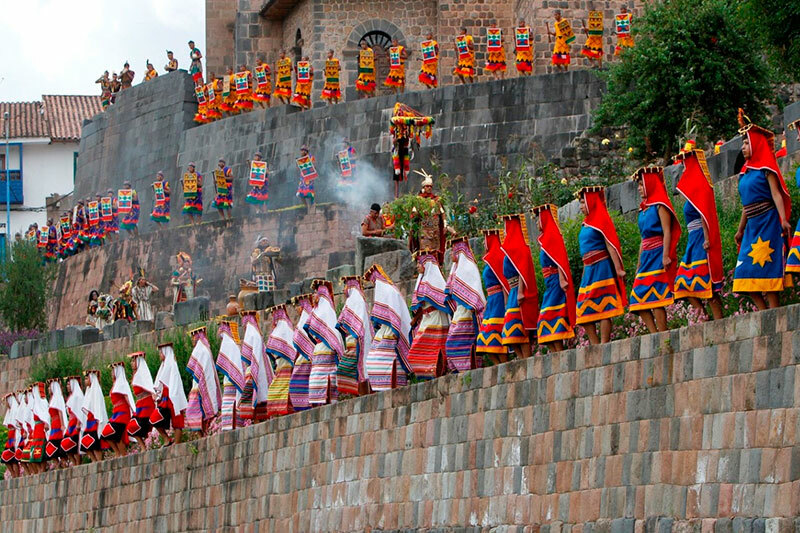 Inti Raymi was the biggest festival of the year in the Inca civilization. Then a ceremonial reading of the Sacred Leaf of Coca is carried out, to see what it brings to the Empire the following year. 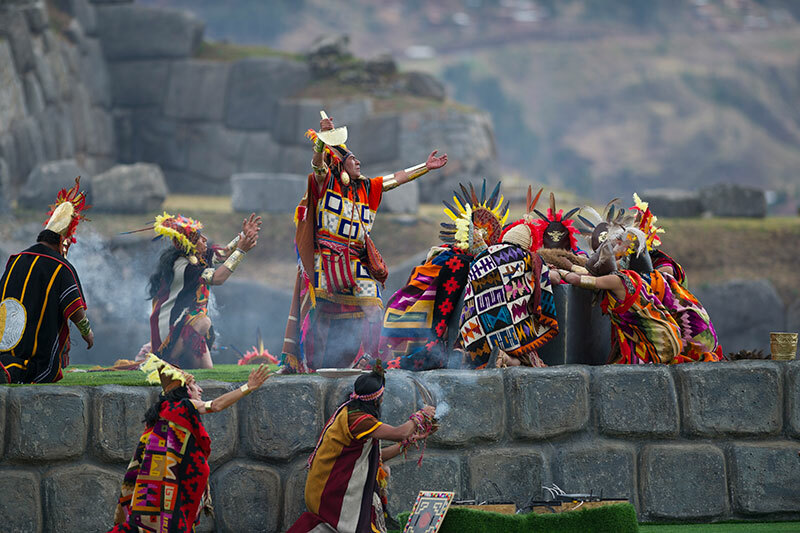 The final part of this recreation takes place in Sacsayhuaman; It is here where thousands of spectators from all over the world come together to appreciate the ancestral celebration. Traditionally dressed, the Inca offers his last words in Quechua (language of the Incas), before the (supposed) ritual sacrifice of a llama. The festival ends with the sound of horns, bread flutes and leather drums. How to see the Inti Raymi? There are no official seats to observe the beginning of the festivities in the Qoricancha, but you can see them from the surrounding streets. The celebrations begin on the outskirts of the gardens of Qoricancha, located next to one of the main avenues in Cusco, Avenue El Sol. You must arrive very early (before 7 am), if you want to position yourself in the best observation points . In the Plaza de Armas. Almost the total of the Main Square of the Cusco is cordoned off for these holidays; However, if you want to see the celebrations in this place, you should position yourself in the surroundings, along the colonial arches that surround the square. The space available to the public is very limited, if you do not want to miss the action, you can arrive very early to some of the restaurants, bars and cafes, located on the portals of the Main Square, many of these have balconies from which You will not miss any details, however this represents an additional cost that will depend on the place you choose. If you choose to see the Inti Raymi from one of these balconies, we recommend that you book the place with some time in advance, it is the only way to guarantee a place. A seat inside the esplanade of Sacsayhuaman is the best option to see the Inti Raymi. These are first class seats and are sold by prior reservation. There are two seats with different prices: Orange and Blue, costs US $ 140 per adult; Green seats are cheaper, these cost US $ 100 per adult; Children under 12 have a 50% discount. Although you can go by yourself, we recommend going with a guide or as part of an organized group. How to move during the Inti Raymi? On June 24, the entire center of Cusco is closed to regular traffic, this includes taxis and public transportation buses. Only approved tourism vehicles have the authorization to transport tourists from Cusco to Sacsayhuaman. In case you come by yourself, you should walk about 40 minutes, from the Main Square of the Cusco to the fortress of Sacsayhuaman. The closed streets for the Inti Raymi celebration include Avenue El Sol, Main Square, Street Plateros, Street Sapi and Street Don Bosco, although other peripheral access roads to the center can also be closed. Also keep in mind the huge increase in crowds and street vendors.